Puff and I had been dating for a mere 2 months plus a week and change. 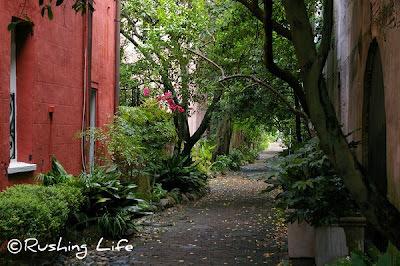 But the travel bug had hit us both and we scooted on down to Charleston, SC, for a romantic holiday weekend. We stayed at an amazing bed & breakfast, spent time on Folly Beach, ate at charming restaurants, toured cemeteries, took a ghost tour. Ya know, all those things you always do in Charleston. Labor Day Monday, the town was seemingly deserted when we wandered out and about to check out some sites. This was just some random alley we passed on the way. I never have been much of a fan of going back to the same city over and over again, but there's something about the southern charm in Charleston that just makes it seem OK. And it's pretty awesome to know that the next time we go, we'll have Bimmer along for the ride! You mean 2008. Pregnancy brain strikes!